International Pier - 2 min. Playa Langosta - 8 min. Carnival Pier - 7 min. International Pier - 8 min. Playa Langosta - 2 min. We will assign the marina to you with your confirmation with complete meeting instructions. Complimentary pick-up also available from Cozumel hotel piers. A small dock fee of $2.00 to $3.00 per person may be charged by some private hotel piers. Drop-off is also available at Margaritaville. This service is not available for Riviera Maya hotels, only Cozumel hotels, and only if your hotel has an accessible pier. Marina Pto. Abrigo - 2 minutes north of town. Playa del Carmen - 20 min. Barcelo Maya - 5 min. Grand Palladium - 10 min. Bahia Principe - 20 min. Dreams Tulum - 30 min. Cancun Hotels - 30 min. Riviera Cancun - 5-10 min. Mayan Palace - 10 min. Iberostar Paraiso - 15 min. Playa Secreto - 15 min. Playa Maroma - 20 min. Don't worry, English is our first language! 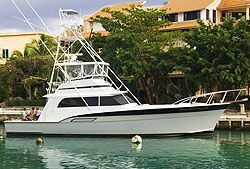 For 8-Hour Charters, Select "0"
The remainder is paid in cash or travelers checks on the day of the trip. You can also pay by credit card or PayPal online or by phone in advance. 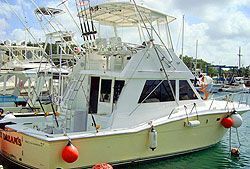 You must have advance reservations to book a charter with us. 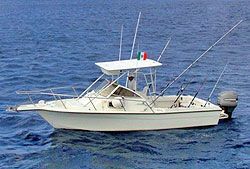 Our boats will be fully booked well before you arrive in Mexico. However, if you are more than two weeks before you leave for Mexico, you can book with confidence. 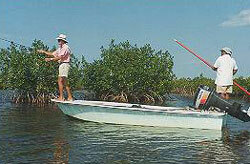 We should have no problem getting you on the water on the day you request. Within 24 hours of receipt of your reservation and deposit, we'll issue you a voucher via e-mail with contact info & directions. For the satisfaction of all our customers, we do not offer shared trips. 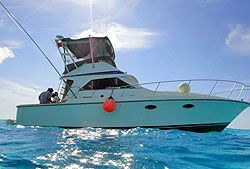 Our private charters will ensure you have the best possible experience on the water with us, which is what you have a right to expect. You are always welcome to meet up with other people at your hotel, on the internet, or on your cruise ship, however, to split the cost with you. Just let us know how many will be coming so we are sure to have enough supplies on board. MARINE PARK PERMIT? WHAT'S THAT? This only matters to you if you will be snorkeling in Cozumel. If you will be only fishing (not snorkeling), or if you'll be snorkeling in Playa del Carmen or the Riviera Maya then this makes no difference to you. However, if you plan to snorkel in Cozumel, then you want to consider this. The best snorkeling is inside of Cozumel's protected marine park. 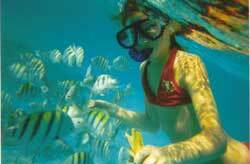 Only a few boats in Cozumel have the necessary permits to enter the marine park for snorkeling. The government limits permits issued so as to help reduce boat traffic and protect the reefs. Our economy boats do not have these permits, but our full size boats do. So, although there is still good snorkeling outside the marine park, the best reefs are all found inside the protected marine park. This is something you'll want to consider when selecting the right boat for you. Again, if you will only be fishing and not snorkeling, or if you plan to select "Playa del Carmen", then you don't need to worry about the park permit. Have questions? Feel free to Contact Us anytime. We're always happy to help you have a great vacation!